When ecological catastrophe leads to political collapse, Earth’s rich and powerful wall up in the high-tech shelter of domed communities governed by the harsh code of survival, leaving the rest of humanity to fend for itself in the poisoned Outside. 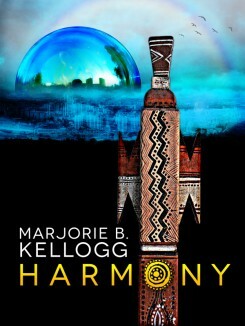 A generation later, in domed Chicago where the Arts were deemed nonproductive and made illegal, young Gwinn Rhys risks all to go to Harmony, a dome unique in its dedication to artists and the Arts. She is apprenticed to a master scenographer, Micah Cervantes. Though he is far too busy, Cervantes takes on a new design project because it involves a company of actors from Tuamatutetuamatu, a tiny Pacific island that has remained alive and well without benefit of a dome. Is this due to a freak anomaly of the climate, or (as others claim) to the magic of the local clans and their folk hero, the Conch? Is the play a simple moral tale, or a dangerous piece of propaganda? When the troupe arrives, they bring some of their island magic with them, along with their anti-doming politics, a distinct lack of respect for the rule of law, and maybe the Conch himself. Or is it herself? First Cervantes’ studio, then the larger apprentice population, and finally the whole of Harmony is swept up in the chaos of their creative process, which turns out to involve a whole lot more than simply putting on a play.